It’s the annual Fleet Week here in San Francisco, and as delightful as it may be to find the city awash in eager young sailors, the kick-off of the week is the Blue Angels air show. They have once again been flying their formations right over my apartment, in a building-rattling, nerve-jangling display that sets off the neighborhood car alarms. It’s common to hear complaints about the enormous expense of these displays, the environmental impact of all that fuel, the potential hazards of any air show, and the way it glorifies war. I can’t exactly say I disagree. But I finally gave up trying to ignore them and went to the roof to watch. The planes really are marvels of technology, and the skills of the pilots were impressive. It was hard not to be awed, and in the right frame of mind it was enjoyable. So in honor of my efforts to see the lighter side of our military-industrial complex, if only for today, I am posting this picture. Oh, so cute! 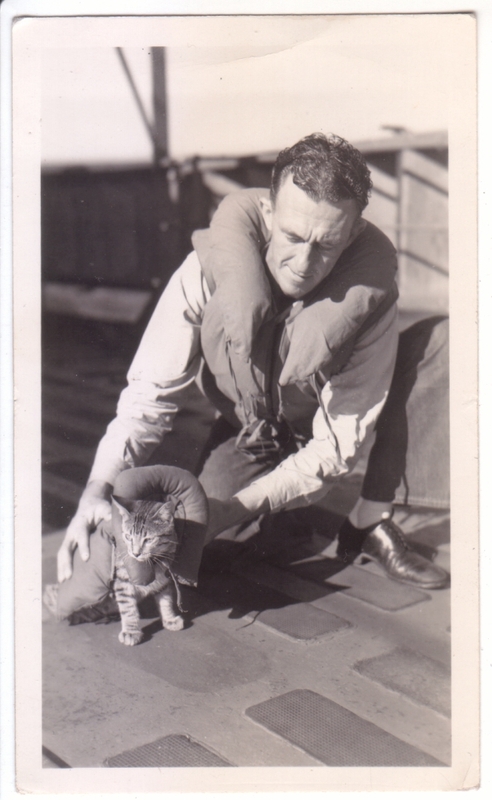 Love the little kitty in its life jacket. We were talking about how “Eunice’s” boots appeared more like work boots than dress boots. This sailor seems to have dress shoes on at work.